While the summer months may be nearing their end, the summer weather isn't leaving anytime soon. 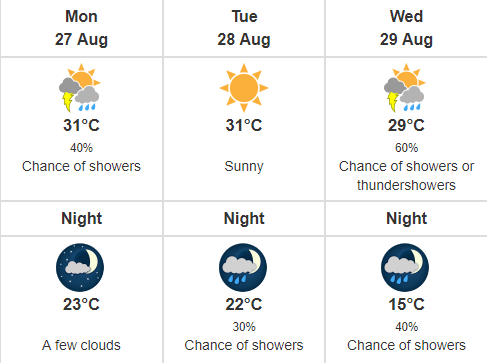 Environment Canada has issued a heat warning starting this Monday (August 27), owing to a humid airmass that will remain in place until Wednesday. During this time, residents can expect maximum afternoon temperatures to reach 31 degrees but feel closer to 40. Overnight temperatures will only drop to the low twenties, providing little relief from the heat, the weather report states. A chance of rainfall is also expected on Monday and Wednesday. As with all heat warnings, residents are advised to avoid heat-related illnesses by drinking plenty of water and staying in a cool place whenever possible. Those who are particularly vulnerable, including children, seniors, pregnant women, and residents with chronic illnesses should be regularly checked on for their health.